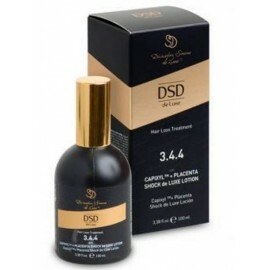 Crexepil DeLuxe forte lotion is intended to reduce hair loss and stimulate hair growth. It contains the most high concentration of hair growth stimulants such as purine and pyrimidine bases, placental extract, adenosine, caffeine, Capsicum Frutescens extract, phytoestrogens, vitamins, zinc, iron, magnesium, silicon, inositol and sulfur-containing amino acids. Contains the Saw Palmetto extract - an ingredient which reliably blocks the activity of dihydrotestosterone (a hormone frequently responsible for hair loss). Exerts a marked vasodilating effect. The presence of panthenol and olive leaf extract predetermine its positive influence on the structure of hair, making hair silky and shiny. The lotion provides a sustained sensation of warmth and freshness. Apply on the scalp with dry or damp hair massaging until completely absorbed. You can also apply the product on the hair. It is advisable not to wash your hair immediately after using lotion to leave on the active ingredients to the hair and scalp. The standard treatment is 2 months, then it is recommended to continue treatment with de luxe deposit Dixidox lotion. Do not rinse, use lotion after intense shampoo.